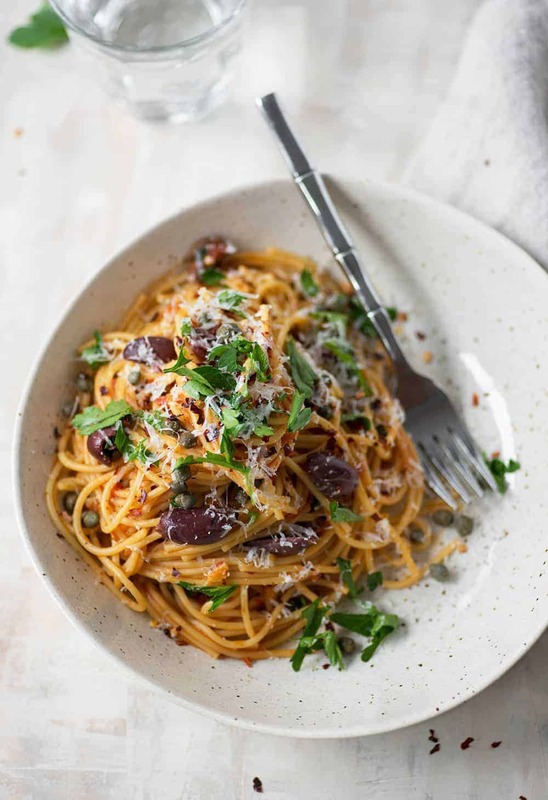 I’ve got a simple recipe for you to ease into the weekend with: one pot spaghetti puttanesca. It’s exactly how it sounds; pasta that only requires one pot to clean and is ready in less than 30 minutes. 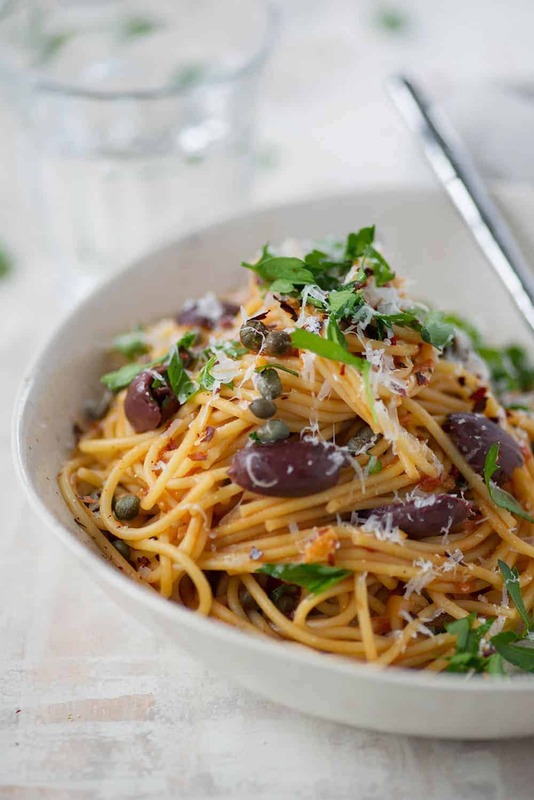 You’ll start by making a quick sauce of onions, capers, olives and crushed whole tomatoes, then add spaghetti and cook until done. Go ahead and press your giant easy button for this one. I’m a women of few words today, but I think that’s OK. Sometimes I don’t need to ramble about my life; I’ll just let the food speak for itself. Puttanesca is one of my all-time favorite dishes. We grew up eating this one almost weekly, as it’s my mom’s signature dish. In fact, her sauce is so good that she gives jars of it as gifts during the holidays. 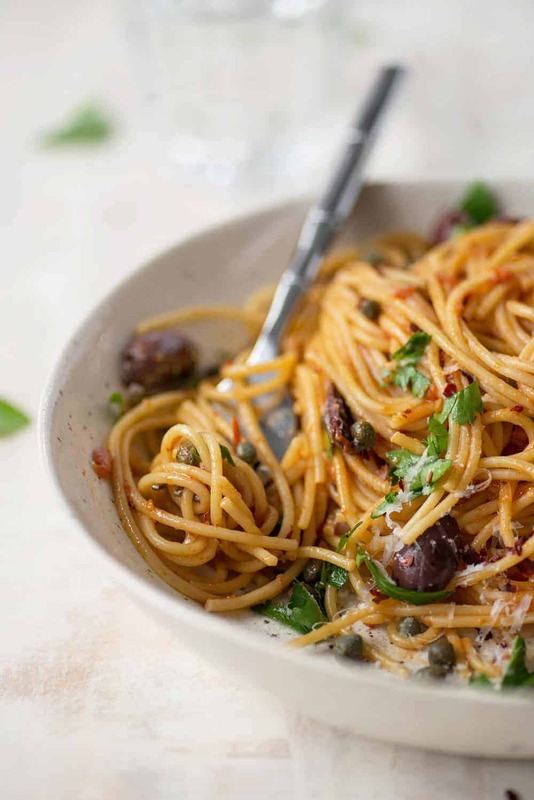 Of course, puttanesca is traditionally made with anchovies, which gives it a unique, salty bite. I’m not going to tell you that removing the anchovies doesn’t matter because well, that’s not quite true. 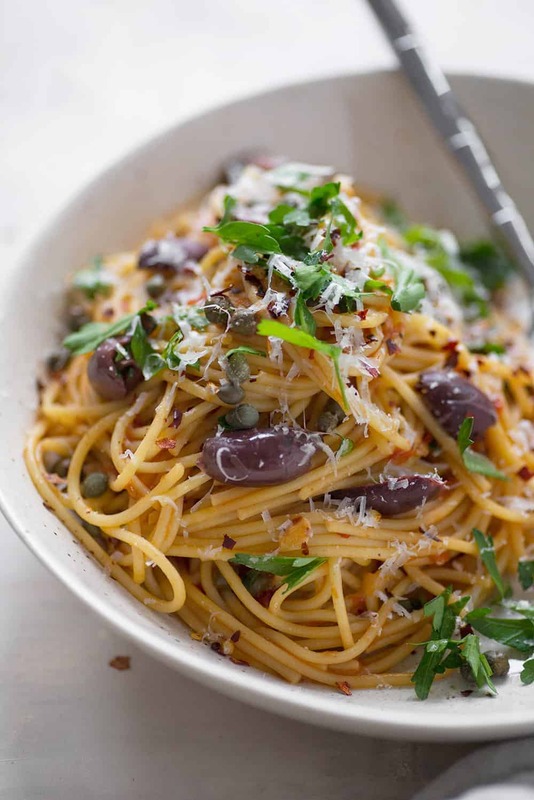 But, for those of us who prefer an anchovy-free pasta, then my tip is to up the amount of capers and olives as I’ve done for you here. You still get the briny taste, without any fish. I created this pasta with weeknight dinners in mind. A meal that you can put together when you really don’t feel like cooking. The beauty of making it all in one pot is that the noodles cook in the tomato and olive sauce, soaking up the salty/umami goodness as it cooks. The result is a creamier pasta thanks to the starches being reabsorbed into the noodles as they turn al dente. The only drawback to a one pot pasta using linguini or spaghetti noodles is that you have to get a little creative when it comes to letting them soften in the water. You can either break the noodles in half and then add them directly to the pot, or let them soak and soften, then push the noodles down into the pot to fully submerge the rest of them. I just break them and add them, but to each his own. Lastly, I think this pasta tastes best with lots of fresh parsley and parmesan cheese at the end. For my dairy-free friends, you can skip the cheese all together or use another version. 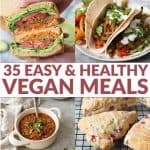 I make a yummy vegan parmesan or you can find some at the store. 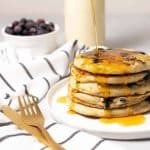 I know it’s tempting to want to skip the pat of butter (or dairy-free butter) at the end, but don’t do it! The butter gives the pasta sheen and helps add richness to the overall sauce. I make a lot of pasta and this is one of my secrets in getting silky, shiny sauce. Oh, and one more thing- I’m calling for whole tomatoes here, which are 1000x better than crushed or diced tomatoes when it comes to texture (and sometimes flavor). I splurge on the good canned tomatoes because I find it really makes a difference. Once you open the can, grab a single tomato and crush it between your fingers before adding it to the sauce; then repeat with the rest of the tomatoes and add in any remaining puree. One Pot Pasta Puttanesca! If you love spicy puttanesca sauce, you’ve gotta try this quick and easy recipe. Made entirely in one pot, with lots of capers, olives and red pepper flakes. Vegetarian or vegan. Heat the olive oil in a large stock pot over medium heat. Add the red pepper flakes and oregano and cook for 30-45 seconds, stirring occasionally, until just fragrant. Add in the onion and cook for 3-4 minutes until softened, but not browned. 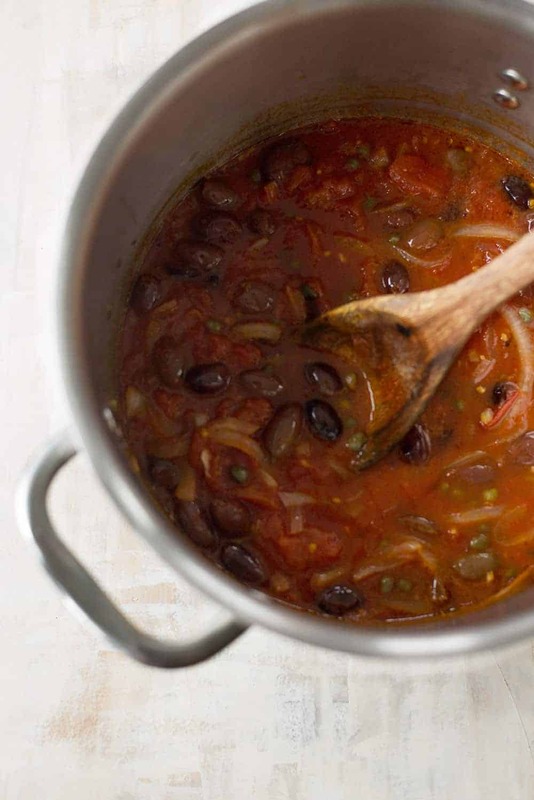 Stir in the garlic, olives and capers and cook another 1-2 minutes. Add each tomato, crushing it with your hands before adding it to the pot. Add the remaining puree and stir together, breaking up the tomatoes again in the pot with a wooden spoon. Simmer for 5 minutes. Add in 2 1/2 cups water and the spaghetti. 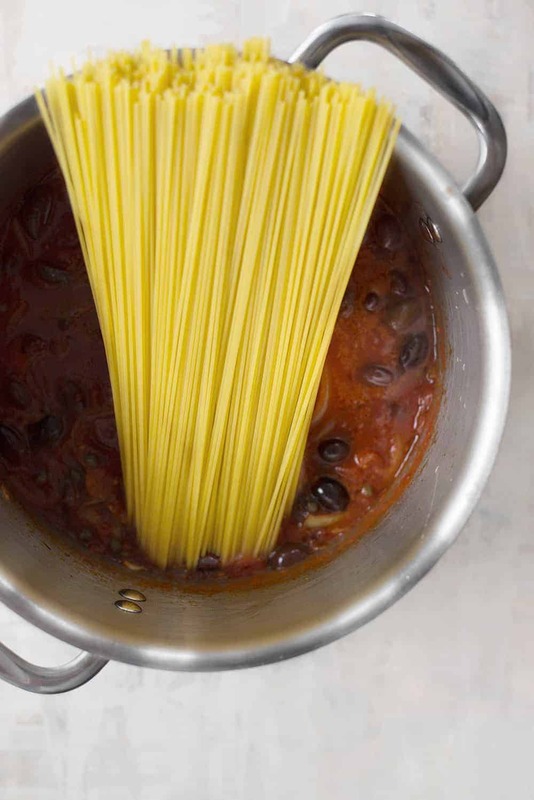 If you keep the spaghetti whole, you will have to let the noodles soften, then gently flip them over and let them soften on the other side before they will submerge into the pot. Or, you can break the noodles in 1/2 and add to the pot. Bring the pasta to a boil over medium-high heat and cook until just al dente, stirring often. The sauce should thicken as it cooks, coating the pasta. If you need a little more water to thin the sauce, add 2 tablespoons at a time. Add the butter and stir together for a glossy sauce. Taste for salt; I didn’t add much since the olives and capers bring in so much brine, but you might want more. Add in the parsley and parmesan cheese, if using. Serve immediately. Hi – Looks tasty! Would you be able to use brown rice pasta for this or would you recommend cooking it separately to add to the sauce? Hi Heather- I’d recommend cooking it separately- I find that brown rice pasta gets too gluey when cooked in the sauce. Just omit the added water; cook the pasta, then combine at the end. HI Alex – I agree brown rice pasta does cook differently. Thank you for the suggestions for using it in this recipe. Look forward to trying it! Made this last night with a few changes; I used an 8 oz package Trader Joe’s spinach linquine, four pieces of canned anchovies and I halved the capers and olives. It was absolutely delish. I never did pasta this way but I will definitely do it again. Nice not having a colander and pasta pot to wash. I did take a photo but don’t do Instagram or twitter so not sure how to post it. Hi Wendy, awesome! So glad that you liked it! And, adding the spinach linguine sounds delicious. Hi Alex. I made this tonight, using whole wheat spaghetti. I cooked the spaghetti separately, and put it back on the heat for another minute after I added the cooked sauce. So yeah, I used two pots and a colander, but it was still yummy! We love puttanesca!! Thanks Connie! Glad you liked it! I made this tonight and Oh My Super Yummy! It came together quick and very easy. I got my 13 year old son who is burned out on pasta from his Aunt to take a few bites and he liked it too. Thank you so much, Alex, for sharing this family recipe with us. Look forward to trying more.